Noah's Ark Folk Art, Hand Made by Maurice and Kelly Dallas. All Noah's Arks are signed and dated by Maurice, Mo Dallas. The fervent love of Noah’s ark still exists, and Mo Dallas folk art creations captivate children and adults alike. Whether you are charmed by the elegant, classic arks (in the essence of antique German arks of the 1850’s) or those more whimsical in nature, his works are indeed keepsakes. Even in the conceptual stages, Mo Dallas gives meticulous attention to detail and the continuity of shapes and hues. 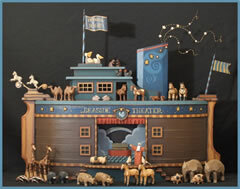 Through the years Mo’s GoodBook Folk Ark creations have expanded to include angels, Noah’s ark Folk Art theaters, zoo’s and Noah’s Ark seaside extravaganza ships. More about us.